In congenital atelectasis of the fetus or newborn, the lungs fail to expand normally at birth. This may be due to any of a variety of causes, including prematurity (often accompanying hyaline membrane disease); diminished nervous stimulus to breathing and crying; fetal hypoxia from any cause, including oversedation of the mother during labor and delivery; or obstruction of the bronchus by a mucous plug. In older individuals atelectasis may be the result of airway obstruction, as by secretions or a tumor (called obstructive, absorption, or acquired atelectasis); or it may be from a failure to deep breathe, such as postoperatively or because of neuromuscular disease. It occurs most commonly as a complication in the postoperative period, when deep breathing and incentive spirometry are often used to prevent or treat it. Mechanisms of atelectasis. 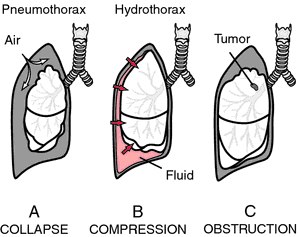 A, Collapse of the lung in pneumothorax. B, Compression of the lung by pleural fluid. C, Resorption of the air from alveoli distal to an obstructed bronchus. Obstructive atelectasis is usually focal. Atelectasis of premature infants, which is caused by a deficiency of pulmonary surfactant, is not shown. From Damjanov, 2000. Symptoms. In acute atelectasis in which there is sudden obstruction of the bronchus, there may be dyspnea and cyanosis, elevation of temperature, a drop in blood pressure, or shock. In the chronic form, the patient may experience no symptoms other than gradually developing dyspnea and weakness. X-ray examination may show a shadow in the area of collapse. If an entire lobe is collapsed, the x-ray will show the trachea, heart, and mediastinum deviated toward the collapsed area, with the diaphragm elevated on that side. Treatment. Atelectasis in the newborn is treated by suctioning the trachea to establish an open airway, positive-pressure breathing, and administration of oxygen. High concentrations of oxygen given over a prolonged period tend to promote atelectasis and may lead to the development of retrolental fibroplasia in premature infants. Acute atelectasis is treated by removing the cause whenever possible. To accomplish this, coughing, suctioning, and bronchoscopy may be employed. In atelectasis due to airway obstruction with secretions, chest physiotherapy is often useful. Chronic atelectasis usually requires surgical removal of the affected segment or lobe of lung. Antibiotics are given to combat the infection that almost always accompanies secondary atelectasis. absorption atelectasis (acquired atelectasis) that produced by any factor, e.g., secretions, foreign body, tumor, or abnormal external pressure, that completely obstructs the airway, preventing intake of air into the alveolar sacs and permitting absorption of air into the bloodstream. Called also obstructive or secondary atelectasis. congenital atelectasis that present at birth (primary atelectasis) or immediately after (secondary atelectasis). lobar atelectasis that affecting only a lobe of the lung; called also segmental atelectasis. lobular atelectasis that affecting only a lobule of the lung. primary atelectasis congenital atelectasis in which the alveoli have never been expanded with air. relaxation atelectasis atelectasis because of large amounts of air or fluid in the pleural cavity, as in pneumothorax or pleural effusion. Called also passive atelectasis. round atelectasis (rounded atelectasis) a localized, reversible form in subjacent peripheral tissue, often following pleural effusion and characterized by focal pleural scarring. congenital atelectasis in which resorption of the contained air has led to collapse of the alveoli. subsegmental atelectasis that affecting only the part of a lung distal to an occluded segmental bronchus. collapse of the portion of the lung distal to an obstructed subsegmental bronchus, manifested as a linear opacity on a chest radiograph. See: Fleischner lines. Collapse of the portion of the lung distal to an obstructed subsegmental bronchus, manifested as a linear opacity on a chest radiograph. Reflux of contrast medium into the inferior vena cava, convex leftward bowing of the interventricular septum, pleural and/or pericardial effusion, and pulmonary findings, including pulmonary consolidation, infarct, platelike atelectasis etc were recorded11.